Khabib Nurmagomedov is making a strong case for why he deserves to be the next person to fight for the lightweight title belt after Gilbert Melenedez challenges Anthony Pettis for the belt in December at UFC 181. 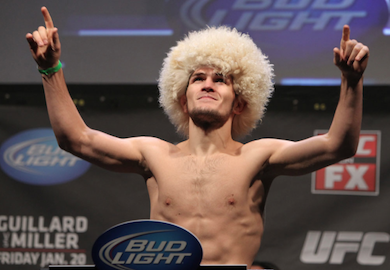 Nurmagomedov made his case to FOX Sports. With a undefeated 23-0 record in professional MMA, and going 6-0 in the UFC, including a win over Rafael Dos Anjos, who recently KO’d Benson Henderson last month. Do you think The Eagle deserves a title shot?